Welcome to part two of our blog series about easy mistakes you can make with your AC. Since summer is arriving in full force, we felt that it was important to make this series a two-parter. The summer heat in Pasco County and Tampa is no joke, and any Florida resident will know how taxing it can be to have an air conditioning system that has gone defunct. Here are some more common mistakes that are really easy to make with your air conditioning system. Avoid these mistakes — doing so will save you money and improve the longevity of your air conditioner! When it comes to cooling your house, you generally have two options — fresh air or air conditioning, but not both. 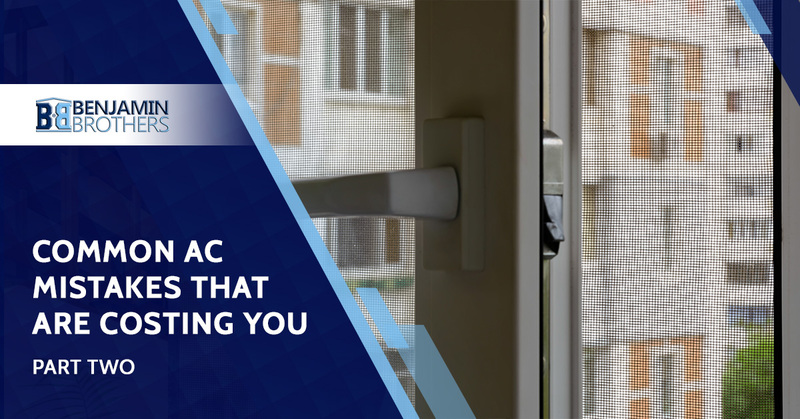 In fact, leaving your windows open lets the hot outdoor air creep into your home, usually making it even hotter than it was before. It is true that open windows can make you feel cooler, but this is usually only true when the outdoor temperature is less than your home’s, or when there’s a nice breeze about that will bring the fresh air to you. Otherwise, it’s best to shut those windows and let the air conditioner run freely. When you let the fresh air in, it messes with the temperature of your home, confusing the thermostat and causing your air conditioner to exert itself harder. This will, of course, jack up your bills and cool your home less efficiently — a lose-lose situation. While most air conditioning and HVAC units are optimized for the homes that they’re sold with, every HVAC has to be replaced eventually, and when that time comes, it can be easy to be led into buying a new system that’s either too big or too small for your home. This can and does make a difference in your home cooling. A system that’s too small is constantly working overtime to try to cool your house, and an excessively large system will cycle on and off, causing your home temperature to fluctuate and aggravating your power bills. When it comes to air conditioning installation, the best thing you can do is consult with dedicated HVAC professionals who have a genuine and sincere desire in helping people with their air conditioning needs. Our team at Benjamin Brothers fits that description, and we’ll be happy to help you understand which AC systems are perfect for your house. As professional HVAC contractors who certainly know a thing or two about air conditioning, trust us when we say that air conditioning shouldn’t be the constant solution that you use 100% of the time for your cooling needs. In our last post, we noted how excessive use costs you money and energy. Instead, it’s a good idea to use air conditioning as a last resort to cool down your home in a pinch when the heat becomes unbearable. In the meantime, there are more passive (and cheap) ways to cool your home. Fans are a big one — if you buy fans for your rooms, you’ll enjoy a cooling effect (even if it doesn’t directly reduce your home’s temperature). Fans can also circulate the air that your AC is pushing out, making the air conditioner even more effective. Looking for more great advice and professional help with your air conditioning systems? At Benjamin Brothers, we’re happy to serve everyone in the Tampa and Pasco County areas. Ready to get started? Contact us today!